These were the modest ambitions of Zach Fischer, 27, when he joined Athletic PlayGround in Emeryville a few years ago. But Fischer shocked himself. Fischer has even started teaching an acrobatics class at Athletic PlayGround. 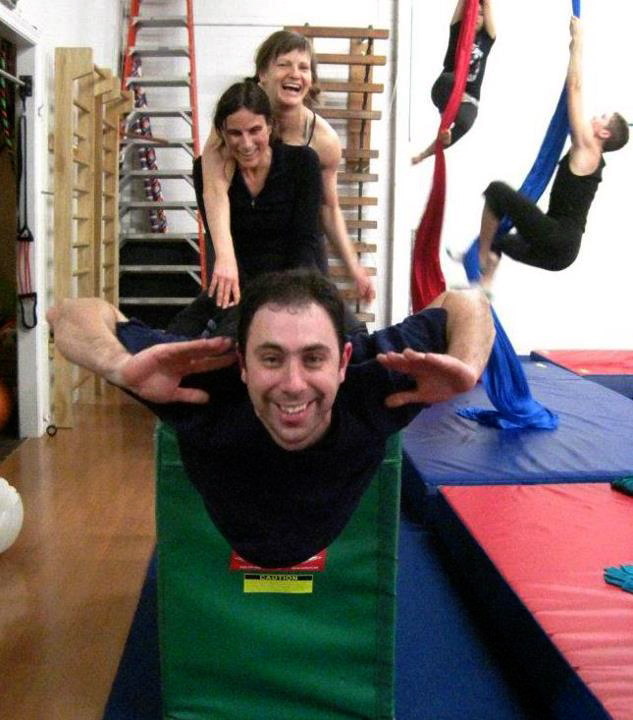 Athletic PlayGround draws its inspiration from the circus, and provides a place where people discover “they can do things they never thought they could do,” says David Grace, who started Athletic PlayGround in 2008 with Shira Yaziv. 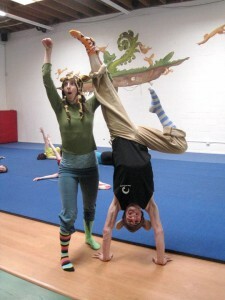 And like the circus, the atmosphere is playful, high energy, and, well, alittle wacky. One member often dances around the gym between rigorous sets of strength and balance exercise. Two others always appear with colorful, mismatched striped socks. And there are monkeys everywhere – monkey toys, monkey murals, and humans doing monkey-like things. “Monkeys are very strong … and very playful!,” says Grace, adding that the gym offers Monkey Conditioning classes every day of the week. In addition to weekly classes, Athletic PlayGround offers specialized workshops every month, including in Acrobatics, AcroBalance, Acroyoga, Aerials (fabric and trapeze), Breakdance/Hip-Hop, Flexibility, Handstands, Hooping, Partner Flips, Parkour, and Monkey Conditioning. Each day’s schedule includes periods of “Open Play” which allow for a diverse range of activity. 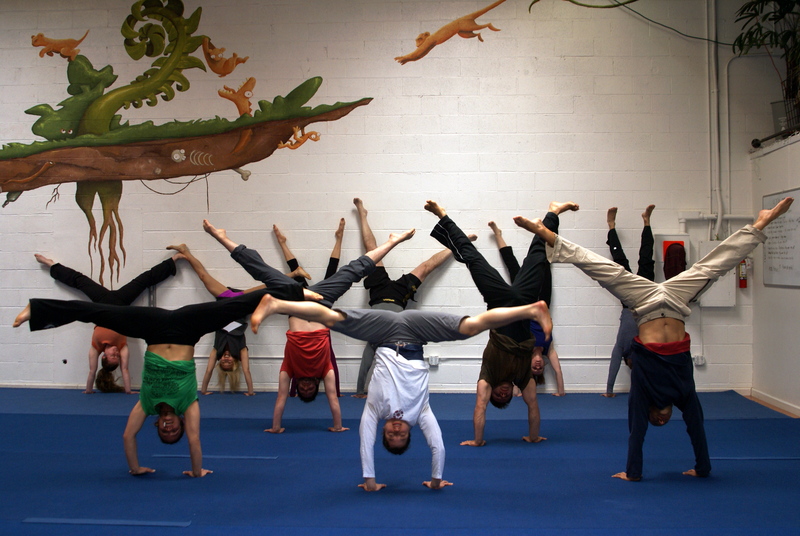 Non-member drop-ins are welcome at most classes. 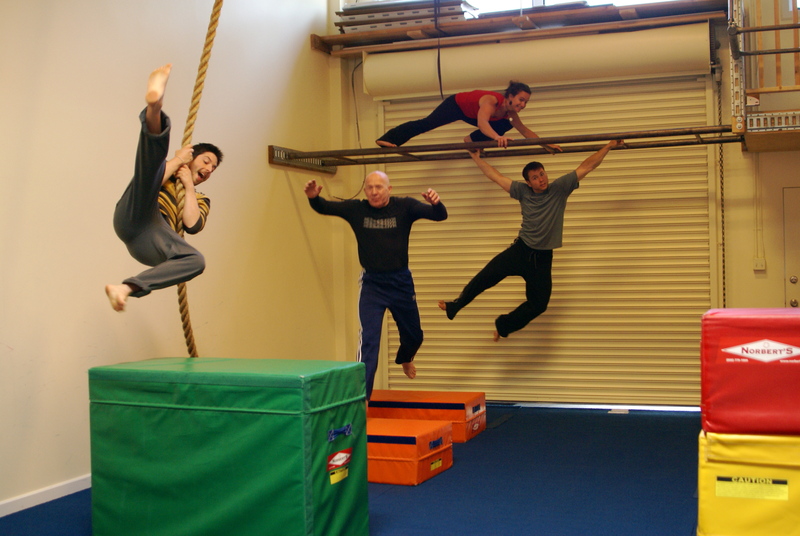 Longtime member Ben Williams comes regularly during Open Play periods, training on hand balancing, handstand presses, and gymnastics strength skills. 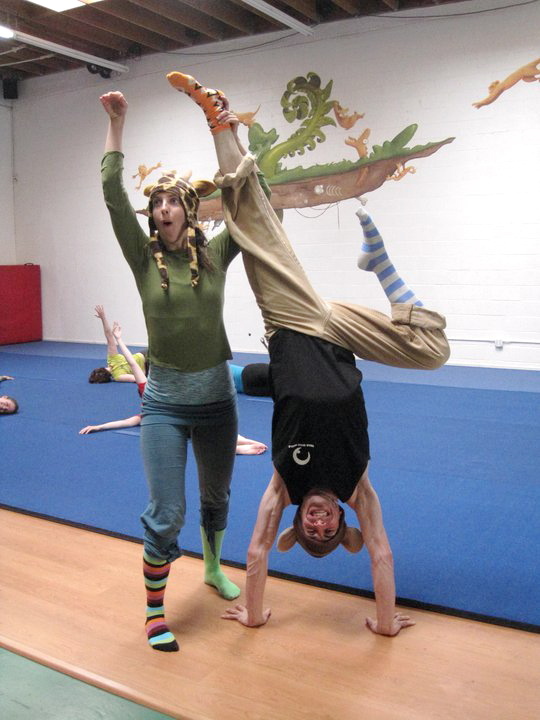 He loves the camaraderie, and values sharing the space with others who are training on a variety of “bodyweight skills” like breakdancing, tumbling, or working on aerial silks. In addition to offering classes and workshops, Athletic PlayGround hosts free “Park Days” for the community to come together to play and eat outside, as well as occasional PlayGround Parties with dancing, open play, and performances put on by members and teachers. 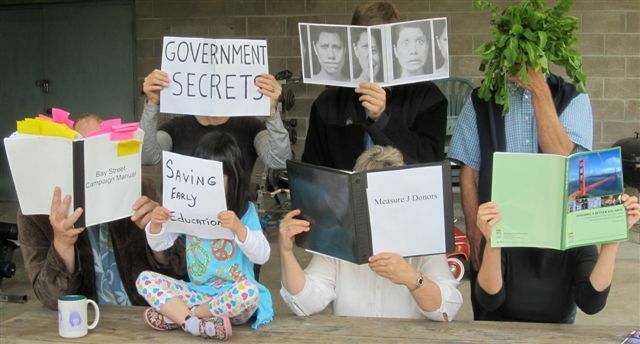 For children and teens, there are afterschool classes and summer camps. Athletic PlayGround is located at 4770 San Pablo Ave (at 48th Street) Suite E, Emeryville, CA 94608. Zach Pine likes his whole-body workouts at Athletic Playground– smile muscles included. He also organizes a weekly informal contact improvisation jam during Open Play time at the Playground. Zach lives in Berkeley. To make a comment or view comments of others, click on the headline to go to the story page, then scroll to the bottom.